Note: The power adapter is packed in the water tank, please lift up the diffuser cap to find it. 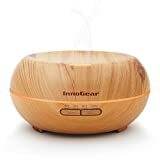 InnoGear 200ml New Plastic Wood Grain Aroma Diffuser is in gorgeous design. It fits in with any decor.The color changing lights make it beautiful in low light rooms. Most of all, this stylish cool mist humidifier adds moisture to your air to eliminate dryness and help with your dry chapped skin, chapped lips and dry sinuses. Add a drop of your favorite essential oil to give your room a fresh, clean scent. Notices: Please add water below the Max line.